Our store is designed to let you try products, beforeyou buy them, to ensure that you take home the sewing machine or vacuum that best suits your needs. We offer unsurpassed customer service, with a knowledgeable staff that is always on hand to answer questions in a casual, no-pressure atmosphere. We are quickly becoming the Salem area's machine embroidery specialists, with a complete line of products, including designs, threads, stabilizers and software, to accomodate the creative pursuits of embroidery enthusiasts. 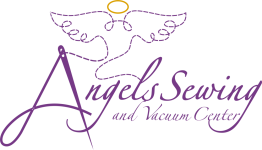 At Angels Sewing & Vacuum, we offer competitive pricing and bundling discounts, with 0% financing on sewing machines for qualified buyers, as well as free layaway plans. As an added bonus, New Hampshire is a no sales tax state...so you'll save even more when you purchase from us!